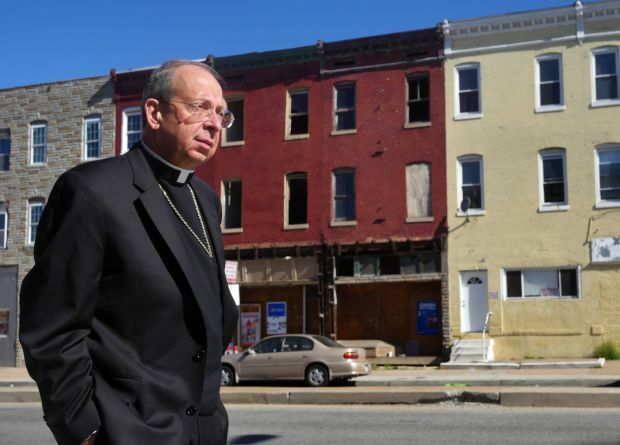 BALTIMORE (CNS) — As the city cleaned up after a night of riots, looting and fires following the funeral of Freddie Gray, Archbishop William E. Lori said the church’s place is to pray, be a voice for peace, and participate in a wider community dialogue to solve the systemic issues that led to the unrest. Gray, 25, died April 19, one week after being arrested on a weapons charge and sustaining a severe spinal cord injury in West Baltimore while in police custody. After his funeral April 27, peaceful protests turned into unrest later in the day, leading to damage of buildings and cars, and looting and fires seen nonstop on national TV news networks. 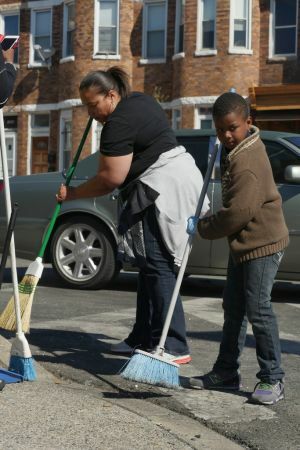 The next morning, as Archbishop Lori, Auxiliary Bishop Denis J. Madden and other archdiocesan leaders toured the West Baltimore neighborhoods affected, adults and children with brooms and trash bags were as numerous as the rioters the night before. Archbishop Lori made stops at St. Peter, St. Gregory the Great and the senior center next door, and at St. Edward, before heading to North Avenue to survey looted buildings and the carcass of a burned car. He said during the unrest he called as many West Baltimore pastors as he could, and spoke to many of them. “We will continue to do a lot of work, especially through Bishop Madden and the city pastors, especially on the west side,” he said. Stephen Scott, who lives just around the corner from St. Gregory the Great, greeted Archbishop Lori when he visited the Harvey and Jeanette Weinberg Sandtown Winchester Senior Center April 28. “It’s sad, so sad when it comes down to this and it hurts everybody,” Scott said of the violence. Shirley Washington, who works at the center, said she hopes those who participated in the violence will realize what they have done. “When it all settles down, you’ll think about what you did wrong then,” she said. At St. Bernardine Parish, a previously scheduled three-night revival opened as the violence flared. “I think we’re all heartbroken over what’s happening, but we’re going to keep our faith in God and keep praying, keep looking for truth and answers, and look for peace as well,” said Msgr. Richard Bozzelli, pastor. He said the parish planned to go ahead with the youth night portion of the revival April 28 in partnership with St. Frances Academy. At the opening, Deacon B. Curtis Turner, principal of St. Frances Academy, preached about the hapless disciples, terrified in a boat in a storm, as they witnessed Jesus walking on water, Msgr. Bozzelli said. “Little did he know when he was preparing that what storm we would be dealing with,” the pastor said. Deacon Turner described the irony of first learning of the mayhem while in Washington, D.C., on a field trip with his students. “We were literally standing under the Martin Luther King Jr. Memorial when we heard about it,” he said. Willa and Brendan Walsh of the Baltimore Catholic Worker Viva House, located several blocks from the violence, said they received many phone calls and emails inquiring about their safety. They responded in a statement on what they saw as the roots of the destruction. “The unrest and anger are the results of decades of unemployment (over 50 percent in our ZIP code), decades of miserable uninhabitable housing, decades of under-funded chaotic schools, decades of the drug trade, and, it goes without saying, centuries of racism,” the Walshes wrote. Public schools across the city cancelled classes for April 28. The Archdiocese of Baltimore did the same, closing all schools except for the School of the Cathedral of Mary Our Queen, located in Homeland, north of the violence.